I love pizza. I mean I really, truly love pizza. I eat it every week, sometimes everyday, sometimes every meal. My favorite kind of pizza is extra cheese. 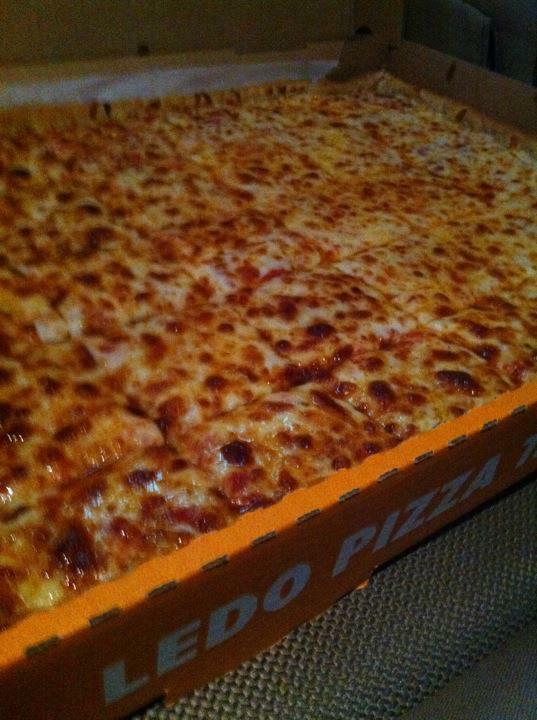 My favorite is Ledo Pizza. I will get a large extra cheese and eat it every day until it is gone – it usually lasts me about four days. I love Ledo’s combination of the smoked provolone / mozzarella cheese blend, sweet sauce, and thin flaky crust. But Ledo’s isn’t the only pizza I eat. If Papa John’s or Vocelli’s is having a deal, I will order pizza from them – extra cheese of course. They both deliver, so it’s a bit easier. And I always keep a few Mama Celeste Pizza for One’s in the freezer for emergencies – the 4 cheese pizza of course. They are great because you can microwave them in just a couple minutes and it fills you up staying under 350 calories. I’m not picky though. I will eat any kind of pizza anywhere. I will eat pizza at baseball games, football games, concerts, at Costco, at casino buffets. And it doesn’t have to be just cheese. I will eat pepperoni, sausage, mushrooms, black olives, chicken, banana peppers, bacon, pineapple, tomatoes, anything but onions. If onions, or anything I don’t like is on the pizza, I just take it off. Pizza is my go-to food. When I was little, my favorite meal was Yoo-Hoo and pizza. Now my favorite meal is sweet tea and pizza. Who says I haven’t grown up?